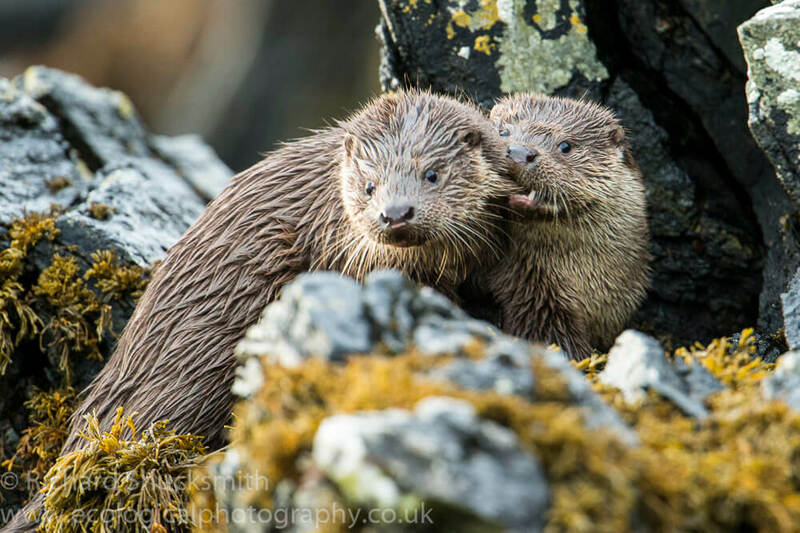 Walking one of my favourite stretches of coast to watch Shetland otters, in particular families, is always a great thrill and often full of surprises. Knowing there is a mother with three cubs and a mum with a single cub on this particular coastline nearly always guarantees sightings of these highly adapted animals. Walking along the coast it wasn’t long before finding one of the families. It was the mum with three cubs but after watching for a little while I realised a cub was missing, there were only two. It was only four days ago I had watched her with the three cubs. For the previous two years females have been on this stretch of coast with three cubs but by the end of November they have always been down to two. It looks like this year is no different. The most likely cause is food supply. I suspect that the number of fish living in the inshore habitats such as kelp beds is not enough for a female to feed her three cubs. Not only that, she does share this coast with another female and cub and they both fish the same area. On top of that there is a resident male and another female that is not quite two years old. It may be a case of too many otters on this stretch of coast, all using the same food resource in a relatively small area. Hence it’s difficult for the mother to catch enough fish to maintain the three cubs. Otters need on average a kilo of fish a day and it is maybe too much for this section of coast. 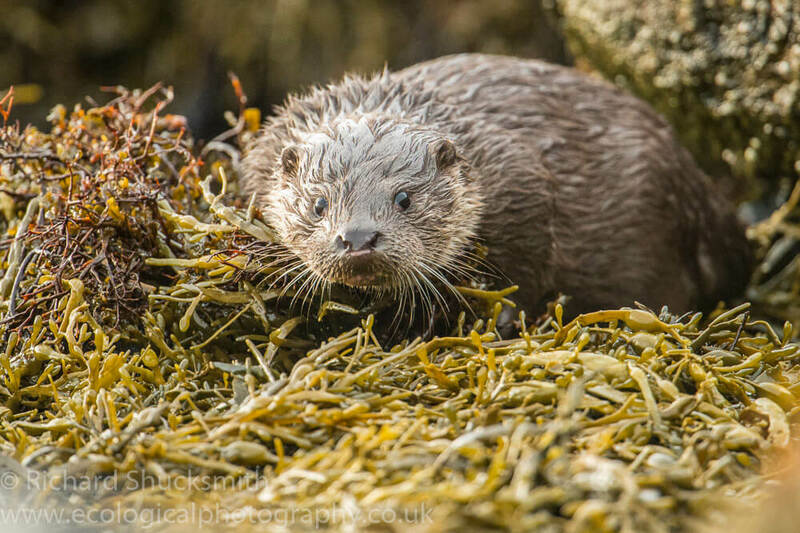 Or it could be that this year the fish that otters feed on have had a poor recruitment year and not many juvenile fish have made it through to maturity. There can be many reasons for fluctuations in fish numbers and coastal ecosystems are complex with multiple factors affecting marine life. 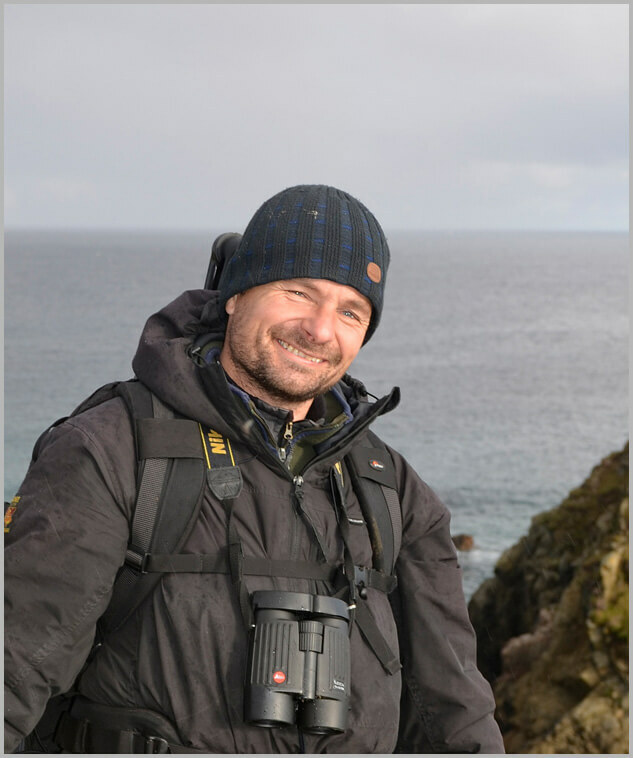 There is a close relationship between the number of fish and the number of cubs seen in the winter. 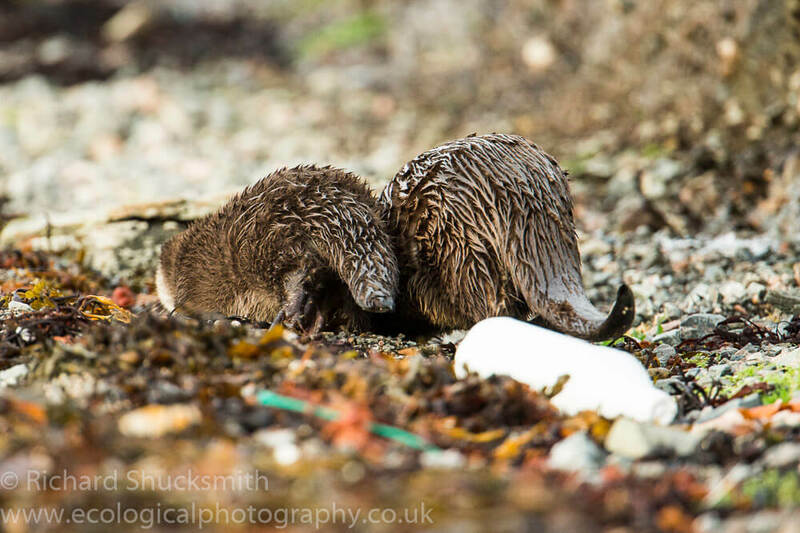 This relationship shows how important the productivity of coastal waters is for otters. 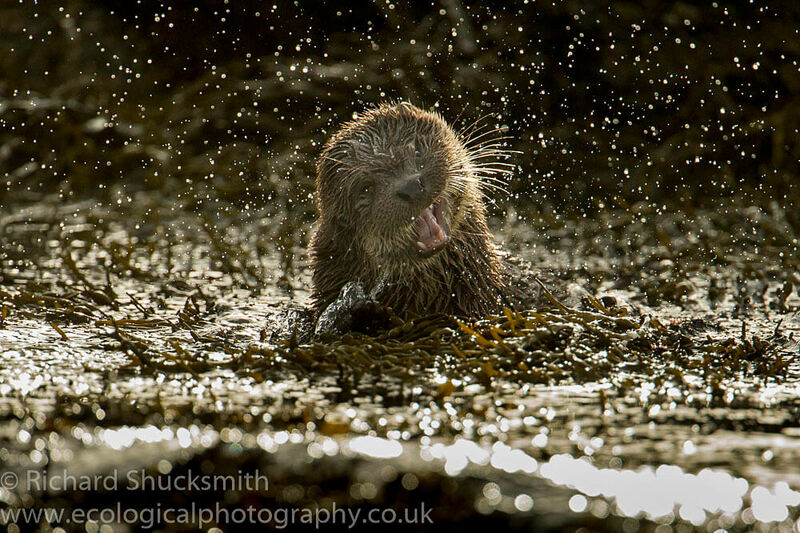 A good friend called me and he had been regularly seeing otters a bit further round the coast. As a crow flies it is only about a kilometre away from the two families but if you follow the shore line due to the many bays and points it’s about two kilometres as an otter swims. It’s an area where I have watched otters in the past but due to the rocky nature of this part of the coast I don’t visit it that often as it is difficult for photography. I slowly walked to the point and within seconds an otter appeared fishing and the familiar squeak of a cub calling, came from the little island about six metres in front of the point. I settled below the bank and before long a small cub swims from the small island to the point. As the cub comes ashore another small cub appears from behind the rock and a few seconds later mum comes ashore with a fish. I watch for a while as mum keeps going out and bringing fish back to the cubs but it’s difficult to see the cubs due to them being behind a large rock. They look about four months old. After an hour I leave them and walk out along the coast to the entrance of the voe. As I reach the end of the headland there is a mum and single cub feeding off the point. The cub is big, probably a year old and I watch as they come in close, work a small bay and then head further along the coast. I leave them and walk back to the female with two young cubs and find them a sleep this side of the big rock, due to the incoming tide. After ten minute they wake up and the cubs looked so cute stretching and yawning. 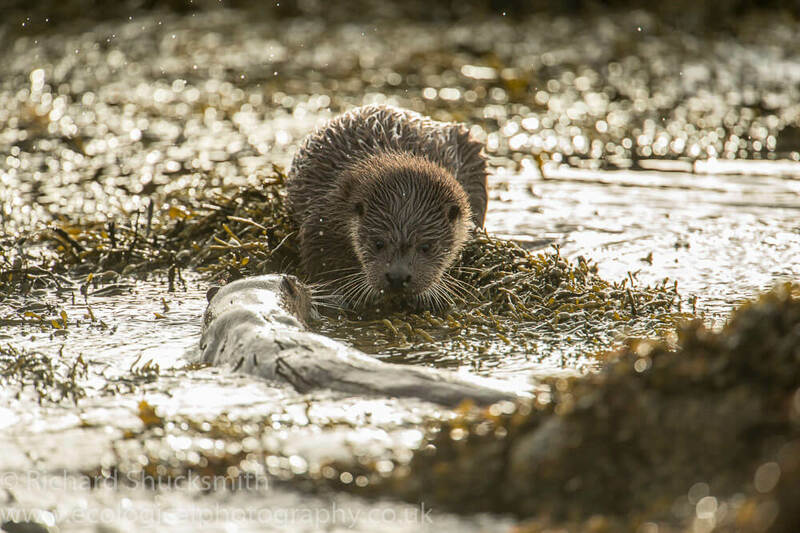 Before long mum is back in the water catching fish and the two cubs start play fighting amongst the seaweed. This soon stops as mum comes swimming in with a fish and the cubs chase after mum for the fish. It is a fascinating winter this year with three young families, an old family, several young females and resident males all using an area no more than five kilometre long. There are at least fifteen individual otters using this area and that is a lot of pressure on the fish population. 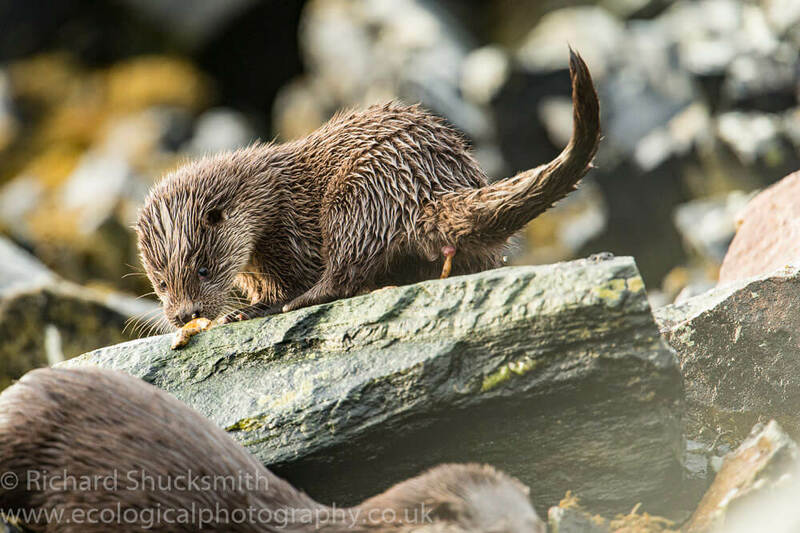 The question becomes; is there enough food for all these otters, in particularly the cubs to survive the winter? Only time will tell and I shall keep you informed as events unfold. Even on the remote beaches of Shetland, litter from sea gets washed up with the tide.